There has been so much speculation and theories as to what was at the bottom but I think it now makes more sense that the scribble at the bottom is the two Greek letters! I never put so much thought into the Greek Alphabet angle before as I thought that Zodiac was just an intelligent game player who just spewed out the letters to mess with people, especially Law Enforcement. But I now understand that Jack mixed Greek and American alphabets together and it was probably unconciously due to a Greek influence when growing up. Letters of the Greek Alphabet is seen throughout the Ciphers and Zodiac Killer letters. LOL! And Voigt thought that having just a GYKE in a Cipher nailed his suspect! NO!NO!NO! It's Jack Tarrance! Gaikowsky isn't a Greek surname! But I think Tarrance is Greco-Roman! i want to add something that i spotted today.you all know about the hopla of the 1990 christmas card right.well i was looking at it and sure enoughf right on the front of the card.the i where dotted way off to the right see for yourself.i don't have it but it is out there to look at. thewraith, YES! Thank YOU! I mentioned something of the nature of the dots being misplaced, in general, at "Jack's Handwriting" thread as Greek Alphabet doesn't have any dots above letters. So, theoretically speaking, if you were influenced somehow by somebody who used Greek letters, you might have trouble with the dots over letters! I am going to check out the old 1990 Card, again! Great to have an opportunity to go over what was missed and actually makes sense, now! The following excerpt is from Rodelli's view on his Mr. X. [IMG][/IMG]"[I]In his first taunting letter, which he sent to three local newspapers on July 31, 1969, the killer (who had not yet given himself the name “Zodiac”) included his first cryptogram--a coded message set forth in seventeen obsessively neat columns by eight rows of symbols derived from the Greek alphabet, Navy semaphore, letters of the alphabet, and astrological signs, with some arcane symbols mixed in. [/B] He had cleverly divided up the message into three parts and mailed one section of the code with each letter. In the accompanying cover letters, which were signed with the killer’s soon to be famous crossed-circle symbol, he claimed that when you solved the code, it would reveal his “idenity.” However, when the code was quickly broken by a high school history teacher and his wife no name popped out. Intriguingly, however, the last eighteen symbols were found to be nothing more than “gibberish” that remains unsolved to this day. Nobody has ever been able to make any solution to that coded message (or to the “gibberish” at the end of it), which has become a sort of a “reflecting pool” in which clues to hundreds or even thousands of different suspects has supposedly appeared, or any of Zodiac’s three other coded messages, convincing enough to lead to a definitive solution of the case." You are wrong Rodelli. It is Jack Tarrance. Jack was in the Navy & there are FLOVs in the 3 ciphers and 3 mirror JT or JTau's but non-the-less this is Jack's Identity as he had FlOVA tattoo'd on his arm and Ina Flova is a Greek name. I get so tired of seeing all these claims that Zodiac didn't leave his name, etc, in the communications. He definitely did and in so many ways. 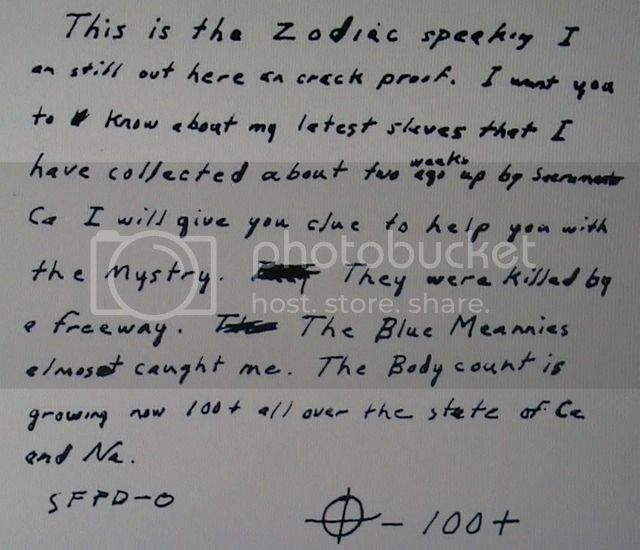 I am very, convinced that Jack was proactive in trying to tell the world who Zodiac was. Hi, all! OK? This is a work in progress but I think I just got the June 26, 1970 letter cross/circle symbol -12 equation with the Phillips 66 Mt. Diablo clue. If you look at a map of California and then the Phillips 66 map and the cross/circle symbol -12, well, in using Radians, like Z said, there are 360 degrees in a radius, 90 degrees in a Radian and 90 degrees minus 12 degrees draws a straight line to South Lake Tahoe. 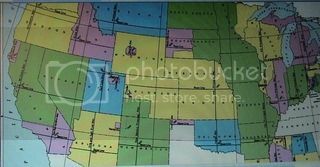 Dennis has said in this MB that Jack was trying to tell the location of where he was at using Radians and the map. Bear with me as this is a work in progress, so, later on I will put the Z Phillips 66 map and a California map and the bottom part of the June 26 letter with the symbol -12 and I think you will see what I now believe I understand. [IMG][/IMG] This Phillips 66 map and the radius circumfrance hit me all of a sudden this morning. So, when I got home this afternoon, I spent some time trying to compile the maps and the letter to get this solve into simple terms. The 6/26/70 letter has at the end what looks like the Zodiac symbol but has a -12 at a point on the symbol. So, it's not a Zodiac symbol. 10/23/09 WRONG: It's 4 radians in the 360 degree radius of a circle. The same symbol on the map has what looks like clock settings, so, I believe he's telling us to go clockwise and 0 to 360 degrees radius is in a clockwise direction. 10/23/09 It's WRONG: There are 360 degrees in a radius/circle, 4 90 degree radians in a circle, the first radian is 0-90 degrees, the 2nd is 91-180 degrees, 3rd is 181-270 degrees, 4th is 271-360 degrees. I believe radians play a part with mapping and coordinates. The -12 in the first radian is 78 degrees, it's marked at the 78 degree spot. Drawing a straight diagonal line, the first city is South Lake Tahoe. Couple this with the letter and the cipher decoding into Jack Walker T and the previous codes that had FLOVs, the authorities would have found their suspect: Jack Walker Tarrance w/Flova tattoo living in South Lake Tahoe. This site has helped in this solve with all it's details about Jack and radians. Thanks Dennis and all who had their own ideas on this map. I hope this helps you Dennis. 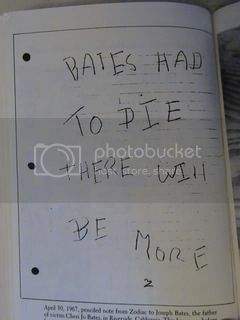 I hope this also helps people to easily understand that Jack Tarrance is Zodiac Killer. Edited 10/23/09 WHAT? My Math is so messed up. Ummmm...first off, there are 360 degrees in a circle and 90 degrees in a quarter of that circle, but not 4 radians in a circle. BUT the -12 mark is still 78 degrees and it still draws the line to South Lake Tahoe. My apologies for my eroneous mathmathical info yet the outcome is still the same. I would have deleted this misinformation on radians but the stats at photobucket show lots of readers who know this post and it's contents. nice work.it's all coming together veary nicely. thewraith, thanks. I had been working on simplifying the radians and Zodiac and JT angles but got sidetracked with the Greek Alphabet/JT/Zodiac issues. Yesterday, the radians, the 6/26/70 letter/cipher and map just fell into place. edited 9:00PST a.m. Well, I am incorrect as to how many radians are in a circle but the 78 degrees mark in the circumfrance of the circle is still correct and the outcome of Jack and South Lake Tahoe is correct. Catseye, Since I admire all the work you have been doing with your posting of/and use of the Greek alphabet to help in making the JT to Zodiac connection a little more clear, I don't want this post to seem as if I am being critical. I am merely asking for some clarification regarding your post #39. Since one radian equals 57.3 degrees and, there are six radians plus 16.2 degrees in a complete circle, I was curious as to how you came up with 78 degrees in the first radian..... Oh, I just noticed your editited 10/23/09 WHAT?..... I should have read and digested your entire post before I started writing this. Anywho, you wrote that you believe he is telling us to go clockwise..... However, starting from what point? The reason that I am asking you is in regards to the 340-cipher, and yes, like you ask me on another thread (340-cipher thread?... Don't remember), if I was trying to use the 340-cipher in conjunction with Phillips 66 map, even though I believe the letter with the 340 was mailed several months before the Phillips 66/Mt. Diablo letter was mailed, There may be no usable connection between the two letters?? That was the first and most important thing that I was wanting to know. Where do I begin? One copy of the 340, after using a compass to draw a circle around through the cipher using the center plus symbol in the horizantal line of symbols just above the actual center horizantal line (which is an empty space), I just drew lines across the cipher to create twelve equal spaces, as in the twelve signs of the zodiac. That may have been a waste of time because, I've not seen anything by doing this. I wanted to use the radian idea but, I didn't know at what point to start from. If you have any thoughts about a good place to start, I would be happy to hear about it. I recently wrote about my aching head and, I was being serious. After being in a pretty serious car accident in the early eighties, I've plagued by them ever since. Then again, it helps me to retain my ability to appear "eccentric" (wink wink). Bear with me and I just might get lucky and come up with something that makes more sense than Graysmith's incoherent solution of the 340-cipher.Let me see if I can get my mind to wander. Oh yeah....Take care and have a good weekend. trustno1, I am writing this half asleep ( been an exciting/busy week for me) so, the 78 degrees looks to be 90-12 equalling 78 degrees. Since 360 degrees is the circumference of a circle, then the first quarter of that circle is 90 degrees and the symbol on the letter and map is divided into quarters. The -12 is at the 78 degree mark of the first 90 degree quarter of the circle, so, again 90-12 is 78. Then looking at the Phillips 66 map, the divided circle has 0 followed by 3, 6, 9 all in clockwise fashion and the circumference of a circle is in clockwise fashion, too 0 to 360 with 90 at the first quarter, 180 at the 2nd, 270 at the 3rd with 360 at the end of the 4th. 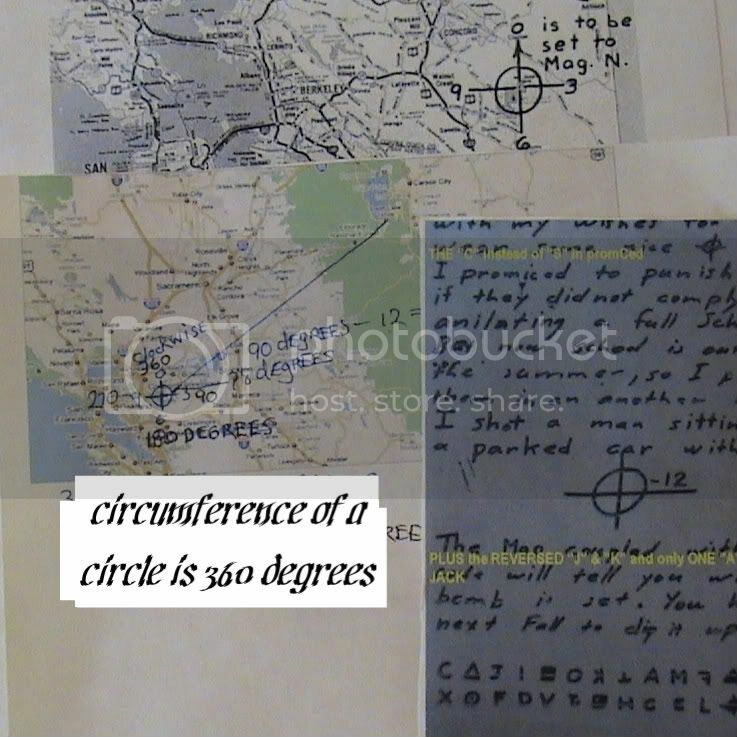 All this said, somewhere on this site, there's supposed to be radians using that same symbol on the Phillips map, that extend outward to pinpoint locations of Zodiac crimes, and I believe it includes the 78 degree mark of the radius with a line from inside the symbol that goes out to South Lake Tahoe. Once I locate it, I'll put it here. Anyway, I need to bone up on my mathmatical skills. I got blinded by the Greek Alphabet thing. Sorry to hear about your accident. I am a severe car accident survivor (Cadillac totalled in 1970s, back took 4 years to heal), then fell at work, so reinjured my back and broke shoulder 30 years later and I sometimes suffer from migrains (head slammed the floor) so, I know a bit about those stop the world headaches! Once the headache stops, the world gets going again and so do I. [IMG][/IMG] This placement of 6 radians is from Dennis main page and it's in his own handwriting. The red lines are the for the Paul Stine, Lake Berryessa, Lake Herman Road crimes. The other lines extend out to Riverside Bates murder, Jacks Sunnyvale 1969 residence, Jacks '60s Nyaac, Calif. residence, Jacks camping ground. If I understand correctly, the radians are placed starting from within the circumference of a 360 degree circle. Starting clockwise, 0-360 degrees, the Mt. Diablo symbol is in 4 90 degree quarters with the -12 mark on that first 90 degree quarter being 78 degrees. That mark/line extends out to South Lake Tahoe. Jack was living in South Lake Tahoe 1970, according to the main page of this site, when the 6/26/70 Mt.Diablo Code map/letter was sent. Thanks Dennis for the hard work. I feel that I am saved-by-the-bell with your previous work on the radians and Zodiac Killer crimes and what I understand about the radius of a circle. Phhhewwww! [IMG][/IMG] Dennis, I hope you can bear with me on this thread! I re-discovered your picture of radians and unsolved murders on the lines at your main page. I had checked over the years about Zodiac, Baselines, Meridians but it didn't seem to click for me as a reason why a killer would use them. Now, I think I get it. Winnie, a former member/poster of this site had some interesting things to say about radians and I believe it had to do with Baselines & Meridians. Lurkers and Members please read her thoughts on this issue. Thank YOU, Winnie! Since Jack is suspected in other murders, it appears that if you place the same Mt. Diablo Baseline & Meridian symbol at 0 and not at Magnetic North 17 Degrees then place it at other Baselines/Meridians, the radians extending outward may place at Texas Phantom crimes, Lipstick Killer Chicago crimes and Black Dahlia (using the San Bernardino Baseline & Meridian). Placing the same symbol at Magnetic North, and using radian measures, you may get even more details all over the USA. ALL THIS SAID, Seriel Killers often have reminders of their events and by using radians, Baselines & Meridians, these are reminders that place him at crimes. They are not the typical reminders or souvineers....like a lock of hair, a key, a piece of clothing, so, the average Law Enforcement person would not be looking for this. Jacks Hypnosis symbol looked like the Baseline/Meridian intersection and I understand he used Self Hypnosis as a reminder of events. As far as Lipstick Killer, their might be a Datum Point at Monroe & Lasalle Streets in Chicago as a placement line? Sorry if this is confusing but somebody like Jack would know this. I found it while reading all about Radians, Baselines, Meridians and now, Datum Points. 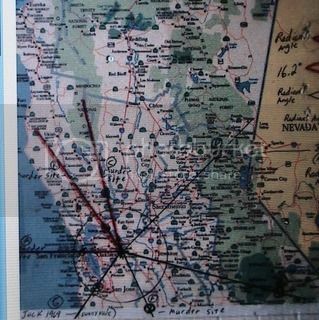 [IMG][/IMG] This is Dennis Kaufmans map of radians and unsolved murders of Northern California using the Mt. Diablo Baseline& Meridian set at Zero. So, if like Z said and you set the Mt. Diablo Baseline/Meridian at 17 Degrees which is Magnetic North, this actually shifts the radian off of Vallejo and San Francisco, IMO, suggesting an accomplice (Hey and we all know Denny fits LB composite, Danny & DNA) but also suggesting more areas to look at for other crime connections. IMO, it could be that Z was using Mt. Diablo Baseline & Meridian set at Zero. If he used both settings, then theoretically there are even more crimes to look at, just in Northern California alone. edited 10/28/09 7:15 PST Theoretically speaking: The "reminders" of the events are the radians and their markers if crimes were committed alone, so, an accomplice is a "reminder" and that's why by using the Mag N 17 Degrees setting shifting the radian/marks off of San Francisco & Vallejo could suggest an accomplice. [IMG][/IMG] Incredible! With all this focus on Meridians & Baselines, Radians, mapping, locations, well, I was questioning why the -100+ at the end of the 1986 Z letter that Dennis has. 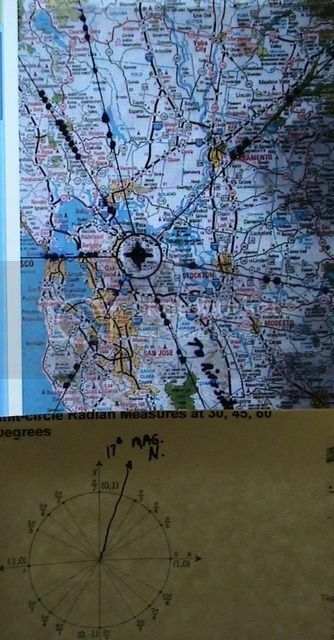 I was wondering if it was like the 90 -12 that equals 78 degrees and that line goes up to South Lake Tahoe...where Jack lived at the time...and wondering if this was a -100+ degrees and not a victims number next to the symbol. Next thing I know, I see the world map of Latitude/Longitudes and that the Cross/Circle symbol can represent the Prime Meridian line crossing the Equator 0 line over a circle. Then I see the 100 degree Longitude line that runs right through Texas and is close to Seguin, TX which is 97.9 degrees Longitude. The 100 degree runs through the county. So? -100+ is the locale of the Seguin, Tx area? IMO, it is and IMHO, Jack was telling part of his hometown cooridinates! That said, SF and Oakland are 37 degrees latitude and Z wrote -37 at the bottom of a letter. I understand Jack knew alot about Radians, maps, locations, compasses, etc.